1. -DELIVERY OF VEHICLES IN PALMA DE MALLORCA AIRPORT: For airport pick up, it is essential to provide a VISION CAR flight number and arrival time right before leaving. You can provide this information either online or by phone. If you do not have this information at the time of booking, make sure you are reporting at least 7 days before departure, either by email or by phone. VISION CAR can not accept responsibility if there is a problem in the rent because he has provided this information late or for not having provided. Seller's delivery policy MOPEDS & MOTORCYCLES: Delivery of mopeds and motorcycles is done in our Central office, which is about 10 minutes from the airport, the Airport Shuttle -Office - Airport is included. 2. 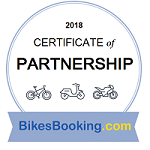 -CONFIRMATION OF RESERVATION: Once we have confirmed the availability of the vehicle category, vehicle delivery will always be at least the category that we have confirmed or higher. All customers will receive a booking confirmation in writing via e-mail or fax. Reservations are normally processed within one working day (Monday to Friday). 4. -AIRPORT PARKING: A charge of up to 15.00.-€ for the airport car park is applicable to the delivery of the vehicle. The customer shall bear the cost of parking ticket, only the date of delivery; The cost of day return ticket will pay Vision Car. In daylight hours,the average price that customers typically pay between 2 € and 5 €, if no flight delays. 5. –RENTAL CONDITIONS: All drivers must be at least 21 years old and in possession of a valid driving licence for at least one year. Drivers under 23 or who have held a licence for between 1 and 4 years must pay 8.-€ extra per day depending on the vehicle’s model or category.. The following documents are also necessary: Passport or DNI, driving licence and a valid credit card. 6.- PAYMENT CONDITIONS: Credit card VISA or MasterCard. We do not accept debit card, Diners Club, American Express, Postepay or cash. The credit card must be in the name of the main driver on the contract. The rent will be charged by Vision Car through an electronic transaction at the time of booking confirmation. 7.-USE OF VEHICLE: Renter receives the rented vehicle and accesories described in this contract in good conditions and undertakes to maintain and drive the vehicle carefully and in accordance with the regulations of the Motor Traffic Rules. To use the vehicle for hire or reward of the carriage of goods. To drive the vehicle when driver’s physical conditions are impaired by alcohol, drugs, fatigue or illness. To use the vehicle to propel or tow other vehicles. To use the vehicle for racing or rallies, etc. To break the seal of or to interfere with the speedometer. Its failure must be immediately notified to Lessor. To transport the hired car between the islands and the mainland or viceversa without permission of VISION CAR. To contract external services (mechanic, cranes) without authorisation of the hire company. If the hired car is used for illegal actions, activities not allowed in this contract, or actions against the Motor Traffic Rules, the hire company could retire the vehicle without money restitution. For reasons of hygiene and cleanliness, VISION CAR does not allow animals to be transported in its vehicles. If this happens and the vehicle is affected as a result, VISION CAR may require an additional charge to be paid for cleaning and disinfecting the car. 8.-RETURN OF VEHICLE: The vehicle will be returned to the place and on the date specified on this contract. Any alteration to the agreed place and date of car's return must be previously authorized by the hire company. The non-fulfillment of this condition entitles the hire company to demand legally in court the return of the vehicle. In case of return the hired car later than the date and time specified on this contract, the renter will have to pay the extra days, plus expenses (if any) of the damage that this action could cause to VISION CAR. Similarly, returning or abandoning the vehicle in a place other than the one indicated in the Agreement, will entitle VISION CAR to require customers to pay: Rent for each extra day needed to retrieve the vehicle and return it to its pre-rental condition so it can be hired again, 35€ as compensation for loss-of-income, and the cost of moving or towing the vehicle, tolls, and safekeeping and guarding, as the case may be, to the place convened in the Agreement for returning the vehicle. In the event that the vehicle disappears or is not returned, VISION CAR reserves the right to bring legal action against the customersbefore the competent authorities with the full weight and consequences of the law. Vehicles must be returned in the same condition as picked-up/delivered. Normal wear and tear is, of course, acceptable. Excessive staining or internal damage will be charged for at the supplier's valet rates. It is your responsibility to check the vehicle thoroughly at pick-up/collection. 9.-RENTAL EXTENSION(S): Extension(s) to your rental can be arranged at least 24hrs prior to your current contract end date. You must call by phone VISION CAR or present on the premises before the end of the current contract. Please note, at busy times (such as high-summer) it may not always be possible to extend. The extension of his lease is subject to availability of vehicle and not an obligation of VISION CAR. 10.-LESSOR'S LIABILITY: Lessor has taken all precautions to prevent mechanical failures, but if such happens, the Renter hereby releases the Lessor of any liability for loss or damage arising out of such failures, directly or indirectly. If the vehicle suffers any kind of mechanical fault, the hirer will take all possible measures to repair it in a reasonable timeframe. If this is not possible s/he will be provided with a replacement vehicle as soon as possible, bearing in mind that the replacement time may vary depending on when VISION CAR is informed of the breakdown and the place where this occurred. Not to admit liability or guilt. To obtain full details of parties involved and witnesses, filling in the form enclosed with the car's documents which shall be forwarded immediately to Lessor. Serious accidents shall be reported immediately by phone. To put in contact with the owner, before removal the vehicle. The vehicle will only be changed for technical defects and when it is not possible to repair in an appropiated time, and always being controled by technical personal of the Company. The replacement of the car will be only possible if the reparation is not possible, and always under the supervision of the hire company. Renter will have no right to substitute the vehicle, if due to an accident the car were unusable. Nor any money will be refunded for the days of renting left or for the accident. 12.- RENTAL CHARGES: Renter agrees to pay in addition to the rental charges and taxes stipulated in hire company’s valid tariff, all expenses resulting from loss of vehicles tools and accesories as well as all fines and court for traffic and other legal violations caused through fault of renter, during term of this agreement. If the vehicle receives a fine during the rental period, you will be responsible for full payment of the fine as well as a 35€ traffic fine management fee. The hirer is responsible for the vehicle’s key, and is bound to pay for the cost of replacing it in the event of loss, theft or damage that prevents its normal use. One of the most common problems is getting the key wet on the beach or in the pool. This damages the internal chip and the key stops working. The supplier will charge if key(s) are lost or badly damaged. Note if vehicle is stolen and keys are not returned to rental supplier, the insurance is deemed void. Please keep an eye on your key(s) as new cars can now not be stolen without them. In the event of requiring the services of the hire company (repairing punctures, loss or theft of the key, running out of petrol, filling up with the wrong fuel, etc.) a call out charge will be payable, which will be €35 within the municipal area of Palma and €65 for all other municipal areas, in addition to the costs of the repairs or materials supplied (these cases are not covered by the optional insurance policy). The time it takes the company to reach the location of the problem will depend on the availability of personnel and may vary depending on the day, time and place of the incident. The charges for the vehicle rental, delivery and return, insurance and taxes set out in the current VISION CAR rates, which were made known to the customers beforehand. The initial rate will be conditional on returning the vehicle at the agreed place and at the agreed date and time. The rates may vary depending on the season and the office where the vehicle is hired. Hence, customers are liable for verifying the rate applicable before hiring the vehicle. The price of the fuel in accordance with the Fuel Policy set out herein. Any other items that may apply to the customers, according to VISION CAR’s contract and commercial terms and conditions. Customers convene that at the end of the rental period VISION CAR may use electronic or any other means of payment, without the customers’ express consent, charges arising from this contract. THE PRICE INCLUDES: Exemption of damages to the vehicle with franchise from € 150 (CDW / TP), I.V.A., taxes, local taxes, theft insurance and unlimited mileage. THE PRICE DOES NOT INCLUDE: The damage insurance (CDW/TP) does not include damage to windscreens, windows, rear-view mirrors, wing mirrors, indicators and lights, tyre blowouts, locks, damage to the vehicle’s under carriage, clutch, engine, sump, catalytic converter and radiator, assistance as a result of filling up with the wrong fuel, loss of keys, Also not included are battery recharge, towtruck, taxi transfer after an accident, deposit for vehicle replacement and compensation for lost rental days while the vehicle is being repaired. or any other improper use of the vehicle and its equipment. OPTIONAL INSURANCE ALL RISK: You can hire in the section EXTRAS an insurance all risk with reduced franchise, breakage of windows, windows, rearview mirrors, tire blowouts, punctures and assistance of crane, the cost per day from 5.- € depending on the model or category of the vehicle. The hire vehicle has civil liability, court bail bond, criminal defence and third party cover, through an insurance policy that the client must underwrite. Note that this insurance policy requires the hirer to pay the first €300.00 for categoriesA-B-C-D, €350 for categories D-F-T-O, €500 for categories H-J, and €1200 for categoriesTR in the event of an accident, plus towing costs if the tow truck is needed, which are set at €150.00 (except in the event of having taken out the optional insurance policy, the amount of the reduced franchise will be applied). This compulsory insurance policy excludes damage to theft and/or damage caused by any reason to luggage inside the car. In the event of an accident, the hirer must contact the hire company immediately. In the event of the driver being under the influence of alcohol or drugs, s/he must meet all costs arising from the accident, not the insurance policy. All scooters and motorcycles carry an excess in the event of damage (from €100). The excess may vary according to the vehicle’s model and category. For scooters and motorcycles a driving licence appropriate to each cylinder capacity is mandatory. Helmets are included in the price. The minimum age for hiring a scooter is 18, for 250cc motorcycles and above it is 21 years of age and for 400cc and above it is 23 years of age. 14.- SUPPLEMENTS – OPTIONAL EQUIPMENT: Baby carriers (9-18 kg) and children’s booster seats (18-36 kg) incur a charge from €3.00/day, up to a maximum of €24 per booking. A GPS sat nav carries a charge from €5.00 per day up to a maximum of €27 per booking. 15. ADDITIONAL DRIVER: Insurance for a third driver carries a supplement of €10 per rental. The maximum number of drivers permitted per contract is 3. 16. PUBLIC HOLIDAYS: On the following days there will be a surcharge of 30 €: 1, 6 and 20 JANUARY, GOOD FRIDAY, 1 MAY, 12 OCTOBER, 1 NOVEMBER, 6 and 8 DECEMBER, 25 and 26 DECEMBER. This supplement must be paid at the destination and is not included in the price. 17.- FUEL: In all rentals the vehicle will be delivered with the full tank, the vehicule must be returned on the last day rental with the fuel tank equally full. If for any reason the tenant had not filled the deposit, the company refuel the vehicle and a charge of the amount will be charged plus and additional charge of €6 for the refueling service. 18.- CANCELLATIONS: Bookings cancelled at least 24 hours before the vehicle is due to be collected will not incur any cost. Within the 24 hours before the vehicle is due to be collected, the cancellation of the booking will incur a penalty corresponding to the price of 1 day of rental. If the cancellation is the result of a no show, without having previously notified of the booking’s cancellation, the penalty will be 1 day’s rental + € 33.00 for airport parking costs (€15.00) + 1 hour’s work (€18.00). VISION CAR reserves the right to cancel the delivery of the vehicle in case of doubts about the financial capacity of the client, outstanding debts or any serious incidents with VISION CAR. 19.- TRANSLATION: The translations of these general terms and conditions are for information purposes only and are not legally binding. Only the original copy in Spanish is considered legally valid. 20.- JURISDICTION: Should any difference arise between both parties, they mutualy agree to submit themselves to the Courts of Palma de Mallorca, waiving hereby any right to any other jurisdiction.